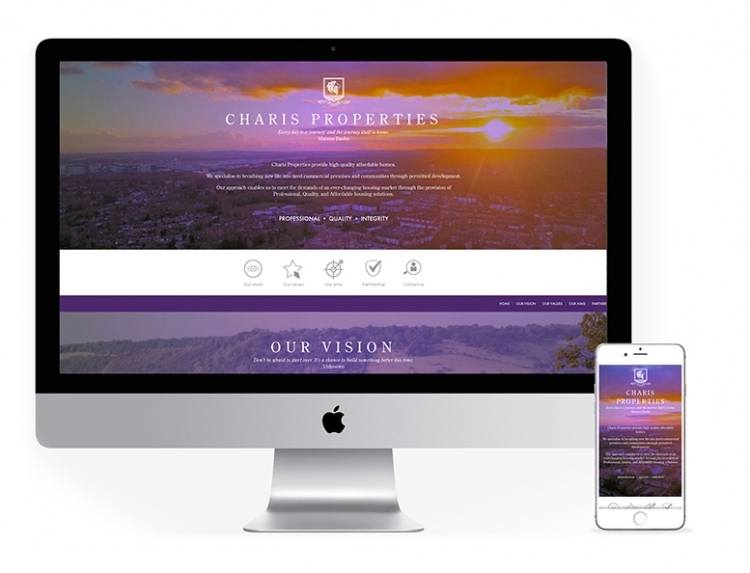 Charis Properties is a residential and mixed-use property development company that specialises in breathing new life into tired commercial premises and buildings by transforming them into high quality affordable homes. Their unique approach enables them to meet the demands of an ever-changing housing market through the provision of professional, quality and affordable housing solutions. Progression Design Agency were approached by Charis Properties to create a new, simple-to-follow bespoke web design that helped explain Charis Properties USP’s and allow for regular updates/additions as the company grows and it’s actives increase. As well as the initial design concept, Progression Design also helped to create a graphic style that can be carried forward onto future marketing materials. Progression also, as well as all the design and programming of the website worked behind the scenes to ensure the website was fully optimised for SEO and Google Analytics. The new website is fully responsive across desktop, mobile and tablet and benefits from having a comprehensive CMS to allow for future client updates and reduce any future cost implications.